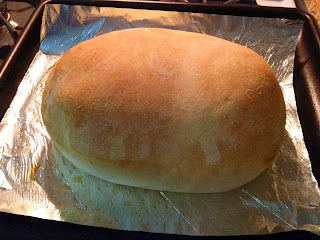 ©Laurel Delaney 2012, "Baked Rhodes Bread"
Here's my attempt at making homemade bread (as shown in photo). Shhh ... it's my single greatest best-kept personal secret: Rhodes Bake-N-Serv (and it's fabulous). The loaf shown (I rarely use a regular loaf pan -- prefer a Bread 101 look!) is Rhodes Traditional (Frozen) White Bread (3-pack). Now the world knows! And the bread while baking makes the house smell like a little bakery. Full disclosure: This is not a sponsored ad but I am hoping Rhodes sends me a lifetime supply of free bread!